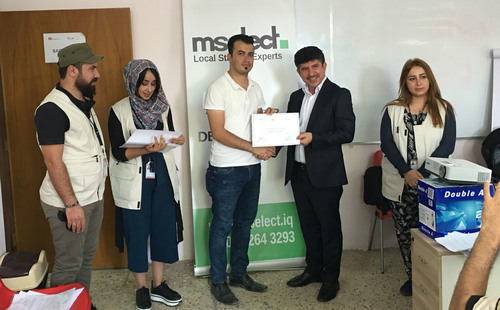 MSELECT Academy recently partnered with the Norwegian Refugee Council to implement the Business Activation and Grants Training program funded by GIZ-Iraq. The project consisted of two segments, Grants and Training on Business Activation. The goal of the program was to promote livelihood opportunities among the IDP community in Mosul, Iraq. NRC granted €2,100 each to 90 internally displaced beneficiaries from the Mosul region. MSELECT Academy conducted three training sessions, in Bartella and Qaraqosh, for the 90 IDP beneficiaries consisting of 40 female and 50 male participants. The training included lectures, individual and group activities, team-building exercises, role play, Q&A, case studies, and in-class quizzes and discussions. This holistic approach to capacity-building ensured that participants absorbed and retained the material in order to apply it to real-life scenarios in an ongoing, sustainable lifelong learning process. A major output of the program was business plans. MSELECT created a business plan for each participant indicating the business idea, budget, marketing plan, and other tools needed for the first six months of startup. As per the project scope, MSELECT assisted the participants choose a business idea guided by our market research in the specific region along with the participants previous experience. Some of the business ideas identified included were a Supermarket, Clothing Store, Beauty Salon, Mobile Maintenance shop, Grocer, Tents and Chairs Rental Shop, Tailor, Fast Food Restaurant, Hardware Store and other types of shops and service parlors. The Norwegian Refugee Council (NRC) assists internally displaced Iraqis (IDPs), Syrian refugees, and host communities in Ninewa, Duhok, Erbil, Salah Al-Din, Kirkuk, Baghdad, Sulaymaniyah and Anbar. They focus on assisting the newly displaced, those in lengthy displacement in camps and those in hard-to-reach places. NRC has also been one of the major cash providers to IDPs in Iraq to facilitate reintegration of returnees in their home areas. NRC complements their cash efforts with a variety of livelihood activities to support returnees' resilience and self-sufficiency. 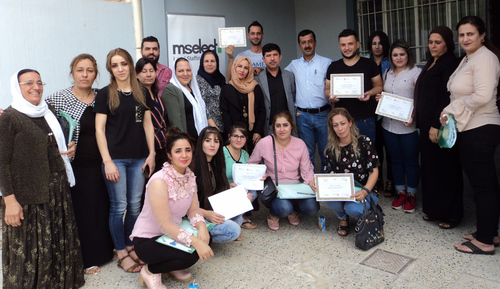 MSELECT’s Training and Development department was established in 2012 to build capacity in the local Kurdish and Iraqi workforce. Our Academy has been working with major international NGOs in delivering vocational and capacity building programs to vulnerable communities. Our certified trainers make use of curricula from international sources which are customized to the Iraqi environment and the learning levels of our beneficiaries.